Saadhana – A scheme that enables female students from modest backgrounds to pursue PUC and higher education with free accommodation facility. The dreams of higher education envisioned by a number of female students from rural areas go unaccomplished owing to reasons such as financial inadequacy and narrow minded ideals. 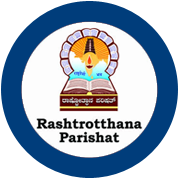 In order to tackle this issue and construct a platform through which such female students can pursue their dreams, Rastrotthana Parishat initiated ‘Saadhana’. at 40 different centres across the state. Girl students studying in 10th standard whose family income is less than Rs. 1, 50,000/-per annum and who score more than 80% marks in their SSLC exams get an opportunity for admission in SAADHANA. Selected students are provided with best infrastructure that includes classrooms, computer and science labs, and library and hostel facility. All needs of the students are taken care of to enable the students to concentrate on studies. The facilities offered here are totally FREE and no money is charged. The aim of SAADHANA is to bring the underprivileged GIRL student to the mainstream and to mould them to become the key contributors in building strong nation. The talented Girl children of the economically backward areas and who resides in remote villages are deprived of higher education for various reasons. Poverty, narrow psychology, lack of opportunity spoils the dream of higher education for girl children. ‘SAADHANA’ has come as a ray of hope for such GIRL children of Karnataka. Talented girl children who gets admission in ‘SAADHANA’ will be given Free PU education and NEET/CET training along with boarding and lodging- all absolutely FREE. For more details, visit www.rpsaadhana.org.